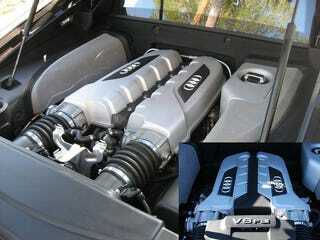 Those rumors about a 5.2-liter, 500 HP-plus V10 being installed in the Audi R8? Yeah, we can pretty much confirm those today. Check out these crystal-clear driveway photos coming from an anonymous tipster of the new and improved Audi supercar. We're told this is a pre-production mule being loaned out to trusted current R8 owners. In addition to two more cylinders, expect a revised front bumper, rear bumper, exhaust tips and side blades for the upgraded Überfahrzeug.